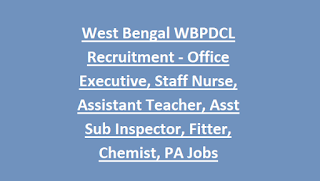 official website of WBPDCL for applying Operator/Technician-Office Executive & Other posts is www.wbpdcl.co.in. The online application forms are available from 1-10-2018 onwards. The last date for submission of application form is 16-11-2018. The candidates will be selected based on performance in written test and personal interview. For the other information of age limit, educational qualification, salary/pay scale, application fee and how to apply are given below for the Operation & Maintenance Supervisor, Operator/Technician and Assistant Teacher (High School) posts in West Bengal WBPDCL Recruitment Notification 2018. The age limit for applying these posts is in between 21 – 32 years as on 01-09-2018. 5 years upper age limit relaxation will be applicable for SC/St/SEBC/Women/Ex-servicemen category candidates. 10 years upper age limit relaxation will be applicable for PWD candidates. Operator & Maintenance Supervisor Mechanical/Electrical is Diploma in Mechanical/Electrical Engineering. Sub-Assistant Engineer Civil/Survey Probationer is Diploma in Civil/Survey Engineering. Chemist – Probationer is B.Sc. Honor’s in Chemistry. Junior Personal Assistant – Degree with 50% marks, Shorthand Knowledge, Computer Knowledge. Office Executive – Degree with 50% marks or Computer Applications Degree. The application fee for the candidates belongs to general category is Rs.300/-. There is no application fee for the reserved category candidates. The candidates will be shortlisted based on their performance in written test and personal interview. For exam pattern and syllabus candidates can refer in the official notification. 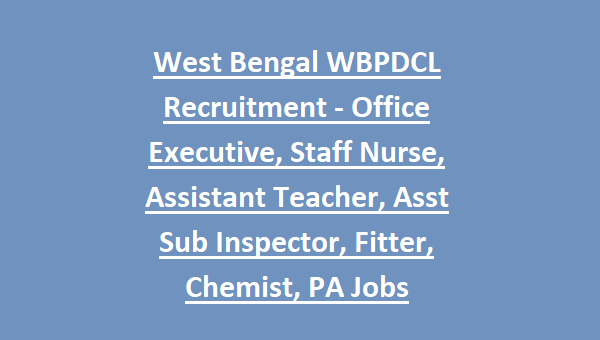 Interested candidates can apply through online official website of West Bengal WBPDCL is http://www.wbpdcl.co.in/ from 01-10-2018. The Last date for submission of application form through online is 16-11-2018. Candidates can pay the application fee at the time of form submission. Candidates can download the Admit card/Hall ticket before 10 days from the exam date. For the other information candidates can refer in the official website of WBPDCL.